Don't miss out on an SAR Membership! As a member of the School for Advanced Research (SAR), you are entitled to a wide variety of opportunities, depending on your level of membership. The links below allow you to quickly access many of your benefits; the full list of benefits for each membership level is available here. If you would like to join our President’s Circle and have access to more exclusive opportunities to attend special events and meet SAR scholars and artists, please click here. The SAR evening lecture series offers diverse and thought-provoking presentations from the world’s premier authorities. Members may attend the lectures free of charge. Find out more about our Lecture Series here. Only SAR members can sign up for the School’s popular field trips. 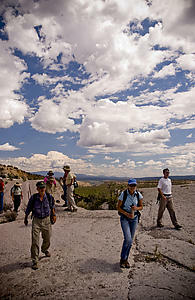 Field Trip on the Pajarito Plateau, Photograph by Jason S. Ordaz © 2008. Offered several times a year, these trips range from half-day trips to adventures lasting several days. Join our field trips here. All SAR members receive a 20% discount on books from SAR Press, one of the premier publishers in anthropology, Southwest culture and history, and Native art. Browse our entire collection here. Tours of the unparalleled Indian Arts Research Center collection of Native art and of the School’s historic campus are free of charge to SAR members. Come visit us, get more information on scheduling here. Members receive a monthly e-newsletter with updates on SAR activities and programs, alumni news, as well as calendar listings and upcoming events. You can sign up here. Membership at SAR entitles you to use the small but valuable research library at the School, and members are allowed to check out materials to take home. Browse our stacks here. Members receive a 20% discount on all branded merchandise including water bottles and hats. Online renewal of your membership is fast, secure, and convenient. Consider upgrading your membership level to receive more benefits. For more information on membership at SAR, please contact Membership Services by calling (505) 954-7245 or by email at members@sarsf.org.